It's that time again: commencement season is upon us. 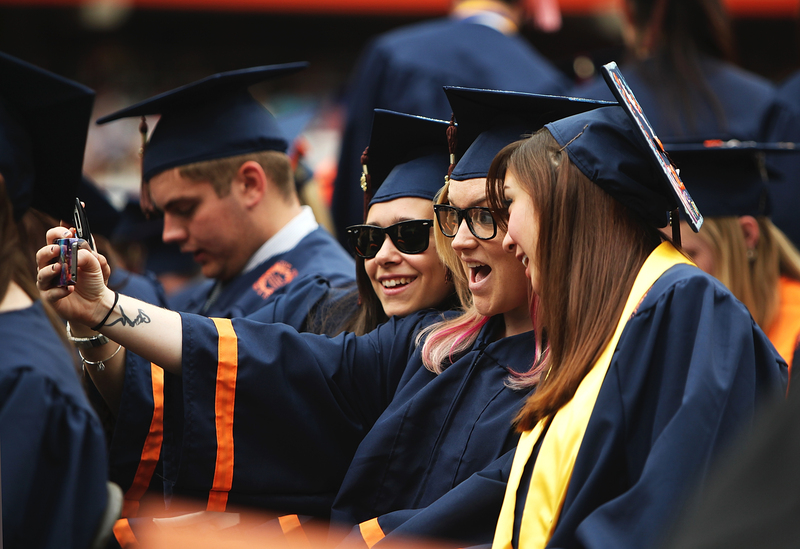 Whether you're giving a commencement speech (check you out!) or merely listening to one, this annual ritual is in the cards for many of us over the next couple of months. I was pleased to see some real talk about such speeches at NPR, and the gist of it is: "Keep It Brief, Commencement Speakers! No One Will Remember Anyway!" That's the opinion of Hal Wilde, former long-time president of North Central College in Illinois, as reported to NPR. He and his college president acquaintances think that finding a commencement speaker is challenging and annoying: everyone's focused on how important and notable the speaker is, but then the speeches tend to be long, boring, and totally forgettable. And high school commencement speakers are probably even worse, seeing as how they are often valedictorians chosen based on their good grades, not on having any interesting or useful life experiences under their belts. As for me, I don't have even the foggiest recollection of my 2003 high school graduation commencement speeches, and I don't remember whether I even attended my little brother's high school graduation. In 2007, when I graduated from college, Georgia State University had some guy who worked at UPS come give the speech. Honestly I don't remember his name, whether he was a GSU grad, or any of the particulars of his life story, but the bottom line of it was that he worked hard and seized opportunities and things turned out well for him in the end. If you're attending a commencement, don't try overly hard to hang on the speaker's every word — you're overwhelmingly likely to forget the speech, and that's fine. Instead, try to just enjoy the experience and time spent commemorating the occasion with friends and family. If you have the misfortune, er, luck to be giving such a speech, Wilde recommends being brief, and maybe funny (if it comes naturally, I'd add), with only a main point or two to make. From psychological research, we know that things you say first and last will be extra memorable to listeners ("primacy" and "recency" effect), so keep that in mind when you're structuring your speech. And if you're involved with planning a commencement, stop shelling out huge money (often $20,000 or more) for speeches everyone will forget! Instead, encourage your institutions to put those resources to academic purposes: what you are allegedly there to honor in the first place.